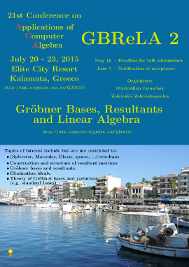 GBReLA 2 is a special session at the conference for Applications of Computer Algebra (ACA) 2015. Its theme lies in the intersection of Gröbner bases, resultants and linear algebra. The talks will range from comprehensible introductions to recent research results and ideas. Beginners in this area will have the chance to dive into the linear algebra approach to Gröbner bases and resultants, while advanced students and researchers will have the chance to learn about new insights into the connections of Gröbner bases, resultants and related matrix methods. Construction and structure of resultant matrices. Theory of Gröbner bases and variations (e.g. standard bases). 09:00 – 09:30 Gregory Bard - A Brief Introduction to the Extended Linearization Method (or XL Algorithm) for Solving Polynomial Systems of Equations. 09:30 – 10:00 Jean-Charles Faugère - Gröbner Bases and Structured Systems: an Overview. 10:00 – 10:30 Joris van der Hoeven - On the Complexity of Polynomial Reduction. 10:30 – 11:00 Dingkang Wang - The Generalized Rabinowitsch’s Trick. 11:30 – 12:00 Anna Karasoulou - Resultant of an Equivariant Polynomial System with Respect to the Symmetric Group. 12:00 – 12:30 Robert Lewis - Symbolic Solution of Parametric Polynomial Systems with the Dixon Resultant. 12:30 – 13:00 Manfred Minimair - Design of a Maple Package for Dixon Resultant Computation. 15:00 – 15:30 Manuel Kauers - Integral Bases for D-Finite Functions. 15:30 – 16:00 Suzy Maddah - LINDALG: Mathemagix Package for Symbolic Resolution of Linear Differential Systems with Singularities. 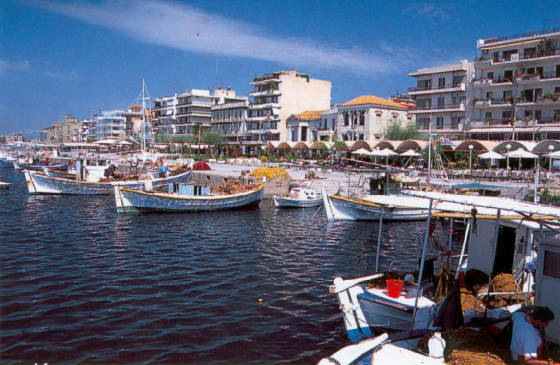 16:00 – 16:30 Dimitrios Poulakis - Bezout Matrices and Roots of Quaternion Polynomials. 17:00 – 17:30 Erol Yilmaz - Linear Algebraic Approach to H-Basis Computation. For travel, housing and related information, please refer to the ACA 2015 homepage. GBReLA 2 will take place as a special session in the context of the ACA - "Applications of Computer Algebra" conference. We believe that ACA is an ideal venue for GBReLA, since many top researchers on the topics of GBReLA as well as young researchers and students will be present.